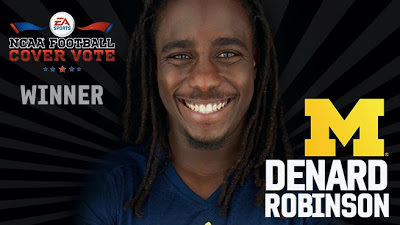 The dust has settled and former University of Michigan quarterback Denard Robinson has emerged as the next NCAA Footballcover athlete. Robinson faced a heated battle against Texas A&M wide receiver Ryan Swope in the finals, but was able emerge victorious after tallying over a quarter-million votes. The "dust", as it's referred to here is the overwhelming number of fake suspicious Facebook accounts that tallied votes for Texas A&M's Ryan Swope after Denard took a huge lead early in the contest. Once voting ended last week, scandal erupted when the result was much closer than it should've been. Of course, EA will not tell us what the final, actual, vote count was...likely because they probably don't even know. Either way, people voted...and so did bots...and when it was all over, EA named Denard the winner. "I want to say thank you to all the fans at Michigan for getting behind me," said Robinson, the NCAA's all-time leader in rushing yards by a quarterback. "Michigan has one of the best fan bases." With the victory, Robinson becomes the third Michigan Wolverine to appear on the cover of an NCAA Football title after former Heisman Trophy Winners Desmond Howard (NCAA Football 99) and Charles Woodson (NCAA Football 2006). "It's an honor to go to Michigan, and for us to be on the cover of NCAA Football." Congrats to Denard. NCAA Football 14 will release on July 9th. Maybe, if we're lucky, EA will read this and we can coordinate some sort of giveaway contest or something. The ball is in your court, EA. And as we've done before, here's my Denard gallery. Il tuo blog è distintivo. Ho trovato il vostro blog innovativo. Hai selezionato argomento molto incredibile per il vostro disegno. Li ho apprezzato.